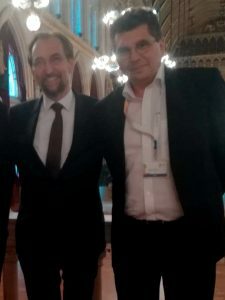 Gestern hatte ich die große Ehre den UN Hochkommissar für Menschenrechte, Zeid Raa’aa al Hussein persönlich kennenzulernen. Ich habe mich herzlich bei ihm für seine Rede bedankt, in der er auch die Situation in Österreich beim Namen genannt hat. Seine Worte sind wichtiger denn je und mahnen uns die Werte der Menschenrechte hochzuhalten und zu verteidigen. Für mich sind sie ein weiterer Auftrag mich für den Verbleib des Rechtsstaates und für eine humanitäre Begegnung einzusetzen. Hier der volle Text seiner Rede. Minister Kneissl, distinguished mayor, panellists, excellencies, colleagues and friends. 25 years ago, which was here in this city of confluence and cultural connection, that the Vienna declaration, that program of action was adopted and with its crucial description of human rights as universal, indivisible, independent and interrelated cut through the artificial division of civil politcal rights from rights that are cultural, economic and social. The cold war ended, and the first words of the preamble marked a great hope for a new era with interdependent countries engaging in a common approach to the causes of human suffering, and I quote “considering that the promotion and protection of human rights is a matter of priority for the international community”. It was here that world unanimously reaffirmed that every refugee from persecution is entitled to asylum and called for effective protection for all those who are compelled to become migrants. It was here that states urged immediate and strong measures to prevent racism, xenophobia and religious hatred and to ensure participation by the poorest people in decision-making. It was here, in Vienna, that states recommended the creation of the mandate, which I am honoured to occupy, the UN High Commissioner for Human Rights. But today, today we seem to be headed in the wrong direction. Backwards to a landscape of increasingly strident zero-sum nationalism, where the jealously-guarded short-term interests of individual leaders outweigh the search for solutions to our common ills. Backwards to an era of contempt for the rights of people who have been forced to flee their homes because the threats they face there are more dangerous even than the terrors of their voyage. Backwards to a time of proxy regional and global warfare, a time when military operations could deliberately target civilians and civilian sites such as hospitals and chemical gases were openly used for military purposes. Backwards to an era when racists and xenophobes deliberately inflamed hatred and discrimination among the public while carefully cloaking themselves in the guise of democracy and the rule of law. An era when criticism was criminalized and human rights activism brought jail – or worse. So this anniversary could be the occasion for a polite celebration of the achievements of my office over the past 2 1/2 decades, and there are many. But today is not a time for soporific complacency. Human rights are sorely under pressure around the world, no longer a priority – a pariah. The legitimacy of human rights principles is attacked, the practice of human rights norms is in retreat. Here in Europe ethno-populist parties are in the ascendant in many countries, fuelling hatred, scarring their societies with deepening divisions. Where these parties have achieved power, they have sought to undermine the independence of the judiciary and silenced many critical voices in the independent media and civil society. They have propagated, distorted and forced views on migrants and human activists. And almost everywhere, across Europe the hatred they direct at migrants has infiltrated the mainstream parties and skewed the political landscape towards violence or great violence and suffering. In this country, which more than most, should be aware of the dangers of ethnically divisive rhetoric, given the historical role of Karl Lueger, false and incendiary statements have been recently made, which are fundamentally at odds with the Vienna declaration. Minister Kneissl, excellencies, as Victor Frankl so often wrote. “It is compassion and contribution to the lives of others which form the anchor of an honourable life”. And a way to honour the Vienna declaration and program of action is to act! Human rights are not just words to be nodded at sagely at anniversaries. They are meant, above all, to be put into practice and anchored, especially in the daily experiences of the poorest and most marginalized people, such as those who flee the destruction of their hopes by conflict and deprivation. There will be no peace for any country until there is respect and justice. There will be no sustainable prosperity unless all can benefit. And human equality and dignity are the path towards peace in the world, a path of real patriotism but in societies grounded in harmony and not divisiveness and hate. So it is a time to stand up for what the Vienna declaration truly represents. We need to use this anniversary to begin to mobilize a much broader community to defend human rights with our fierce and passionate commitment. We need to make clear the vital life-saving importance of human rights for the daily lives and the global future of our fellow human beings. We need to push back against the haters, the destroyers, the isolationists, the ethno-nationalists. We need to move forward defiantly to ensure that those indivisible, universal, interdependent and interrelated rights are able to build on one another, to shape a world of well-being and safety. And there is no time to lose! So let this be a turning point, so that the Vienna declaration can stand proud, not as a decaying museum piece, but as the flag-bearer for a resurgent movement to build peace and progress.